In my 1980s, video games did not even play a supporting role. We didn’t own Atari. My parent’s loathed fads, ‘it’ items. Things advertised between cartoons and things that made moms trample moms in the Toys R Us parking lot. Plus it was expensive. Addictive. An indoor sport. The first in a long line of begats: Atari begat Nintendo begat Marijuana begat Satanism. Occasionally there was Pac Man. A local pizza parlour, owned by the then-mayor, had a decent game room. We would both get a single quarter to wait out our pie. First my brother ripped and jerked the joystick. Then, at the dizzy ‘Game Over’ spirals, he took my quarter and lost again. Back at home he drew me a detailed picture of a Pac Man board on loose leaf paper. Bite sized nuggets inside a maze with tiny jagged ghosts. Pac Man’s mouth open wide, paused with a look of a triumphant roar. My brother told me I could play with that. (Give me a break). 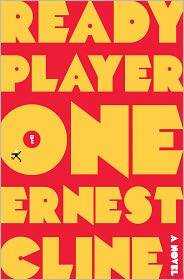 Ernest Cline’s novel Ready Player One, in all its geeky 1980s glory is a vision of 1980s pop culture — it’s not my vision of 80s pop culture and I did have to Google a few things related to Dungeons & Dragons. The gist: All the world co-exists on OASIS a pretty realistic non-reality online world, multi-purposed as fun and educational. When the creator James Halliday dies, a contest is announced in which savvy gamers vie for his fortune. Finding Easter eggs he has hidden within OASIS. This hunt requires plenty of 1980s pop culture knowledge — for instance, being able to quote verbatim a character’s lines from an entire movie and being able to get a perfect score on Pac Man. Our hero is Wade Watts, who has little money and less family, but has spent his whole young life studying Halliday’s interests. He and his posse, including a bestie he’s never met IRL and a girl whose blog he has stalked, take on the evil corporate America to win the prize. This story is a heckuva lot of fun, even without Jelly Shoes and Madonna. It’s boundary-less and inventive and the brain graphics are amazing. Cline’s debut novel had me thinking a lot about my 1980s. My 1980s had two rubber bracelets, linked connected ovals on my right wrist. Plain barrettes woven with alternate-colored ribbons that hung so long they hit my shoulders. White Keds, followed by red Keds, and denim Keds. Jeans decorated with thin white pinstripes. ‘I’ll never in my life not wear pinstripe jeans,’ I told my mom. ‘I don’t believe that’s true,’ she said. In my 1980s I bought florescent pink Wet & Wild lipstick at Woolworth. I wore homemade shorts that hung to my knees, a starchy collage of busy designs. My hair was too fine to hold a perm or a plume of bang so I went hay-straight the ends turned under, bangs hard with spray yet barely made a fan. In my 1980s, I listened to Madonna — but not ‘Like a Virgin,’ only her self-titled debut. My mom knew what ‘virgin’ meant, though I did not, and didn’t think it was appropriate. I listened to Tears for Fears, Wham!, Lionel Richie, and Phil Collins. Michael Jackson and Whitney Houston. Debbie Gibson. Some songs from the 1980s remind me of roller skating at Skate Country, where it was always dark and the lights made neon patterns on the smooth oval floor. Perfect for holding hands with a boy while listening to Journey, then skating to the snack bar for Laffy Taffy. Some songs remind me of roller skating in my basement, grey boom box plugged into the wall, skating in circles while Casey Kasem counted back the Top 40 hits of the week. Some songs remind me of rainy days on a school bus, the smell of rubber seats. And some rainy days remind me of kindergarten and the embarrassment of wearing a yellow slicker in public. In my 1980s I liked ‘Goonies.’ We watched ‘Stand By Me,’ rewinding and rewinding a part where an old man says ‘Loony, loony, loony’ and then we would cackle. I liked Wil Wheaton best. (Still do). I thought ‘Dirty Dancing’ was stupid, but watched it anyway at every slumber party I went to. Later we would crawl across the floor singing, ‘Sylvia? Yes, Mickey? How do you call your loverboy? Oh, loverboy. And if he doesn’t answer? C’MERE LOVERBOY.’ I liked both Coreys in ‘License to Drive,’ and thought Mercedes, with her thick chunks of blonde spiral, had the best hair in the world. The volleyball scene from ‘Top Gun’ set puberty in motion and ‘You’ve Lost that Loving Feeling’ would become a song I would never not know. In my 1980s I most related to Mary Stuart Masterson. Denim shorts to her knees, drum sticks in hand. It was the unrequited-ness of her crush on Eric Stoltz’s character in ‘Some Kind of Wonderful.’ That moment when he practices kissing her. His hands on her hips, morphing into claws as they turn up the heat. She realizes she’s a little too into it and pulls away. I loved ‘Scooby Doo’ and its antithesis ‘Three’s Company.’ ‘Facts of Life,’ and ‘Silver Spoons.’ ‘Punky Brewster,’ the real-live show but not the cartoon. ‘Smurfs,” though. Alex P. Keaton has always reminded me of my brother. In my 1980s, I could moonwalk and do the worm, kind of, in a spastic seizing way. I had choreography for ‘Eye of the Tiger’ that I performed in the front yard and loved to scream ‘GHOSTBUSTERS!’ ‘I could do a back handspring, but not the splits. I could take a soccer ball and kick it in a way that it went over my head and landed in front of me. I had a T-shirt that said Orange Crush, I had a sweatsuit that said “Let’s Get Physical.” I had a two-toned baseball-style shirt that said “Totally Awesome” in glittery balloon letters. I took the Pepsi Challenge, and picked Coke every time. I bought a copy of ‘The Get Him System,’ a self-published book about winning boys advertised in the back of a magazine. It didn’t work; I didn’t even try for the money-back guarantee. I had an Esprit bag slung over my arm and kept my pencils in a LeSporte sac. My stuffed Garfield was dressed in a jogging outfit. I ripped photos of cute celebrity boys from magazines and hung them in a fort. The smell of paper when I matched my lips to Rob Lowe’s. Where Cline’s novel has that glowing green tint of an old-school game of Pong, my lean was more Hubba Bubba pink with a side pony. Nice last line. I wonder if that’s just a gender difference, the pong-green vs. hubbabubba pink. Most women I know would probably lean hubbabubba rather than pong.